Yesterday Preston picked up the girls after they got home from school to take them shopping for some necessary items in Wausau. Well, it was Kara I had asked him to take shopping but Hannah decided to go along as well. Normally he picks up the boys on Friday night. He had been getting them around six which I couldn’t understand since he has no classes on Friday and they have an early bed time and it’s important for my youngest to keep that bed time in order to help control his “moods”. Thankfully the last Friday he was a little earlier on picking them up. Of course last night was an exception because of taking the girls shopping. When he brought them home the girls were in a most lovely mood and Hannah told me she actually had a good time with dad. I was happy to hear that. I don’t believe it was just because he bought them things and took them to the oriental buffet near the old mall. (That one, btw, is very good!) It’s been a while but he’s taken them shopping and to dinner before but it seems this time he was able to talk and relate to them which made the big difference. I believe their getting older and more mature is what has really helped. Still, it was good to know. Kara was pleased to be sporting some really cool new boots as well as the items she needed. Hannah got a few new pants, thankfully, and the big surprise was that she actually got a winter jacket. She seemed very comfortable in it too. Who knows, maybe she will let go of the tattered jacket liner she insists on bringing almost everywhere with her. I’m not getting my hope up just yet, but, could this new jacket be the one?! Things like this, the tattered jacket, that is, have really helped me get over caring about what others think of me. I think most of us parents with kids in the spectrum can say that. For instance her tattered jacket often makes teachers think I never do laundry and have never washed her jacket. When she was younger she used to relate family stories and conversations from her view point and often her idea of what certain words meant were not what others felt they meant. Sometimes I would defend myself and explain and other times I just let it go and block my mind from it’s normal people pleasing way. I recall one time when Hannah was in grade school in Hawaii I got a call from my new friend. We had been car pooling the kids to school. My new friend informed me that she wasn’t sure that she could be my friend anymore cause of something Hannah said. I already was aware that Hannah had an unusual way of relating things to people so I asked her what it was she had told her. Hannah had told her basically that we didn’t celebrate Christmas because of our religion and for Thanksgiving I made sour turkey. I learned later that my new friends mom (who would later also become a very good and dear friend) had a very abusive childhood and her folks had often used Christians to play mean mind games on her so the holidays, like Christmas, were very important in a kind of sacred way to them. As for me back then, I was on the precipice of leaving the cult I had been in for many years but hadn’t quite “woke up” just yet. We were not allowed to celebrate the holidays except Thanksgiving and we couldn’t celebrate birthdays as well. Strangely, anniversaries and mothers and fathers day were ok to enjoy. What it really came down to was what the church leader was into celebrating. To make it even worse, back then Preston really didn’t like celebrating the holidays or any other thing that even the church leader was ok with so we really only had Thanksgiving. However, I mostly felt I should leave others alone about the holidays and their traditions. 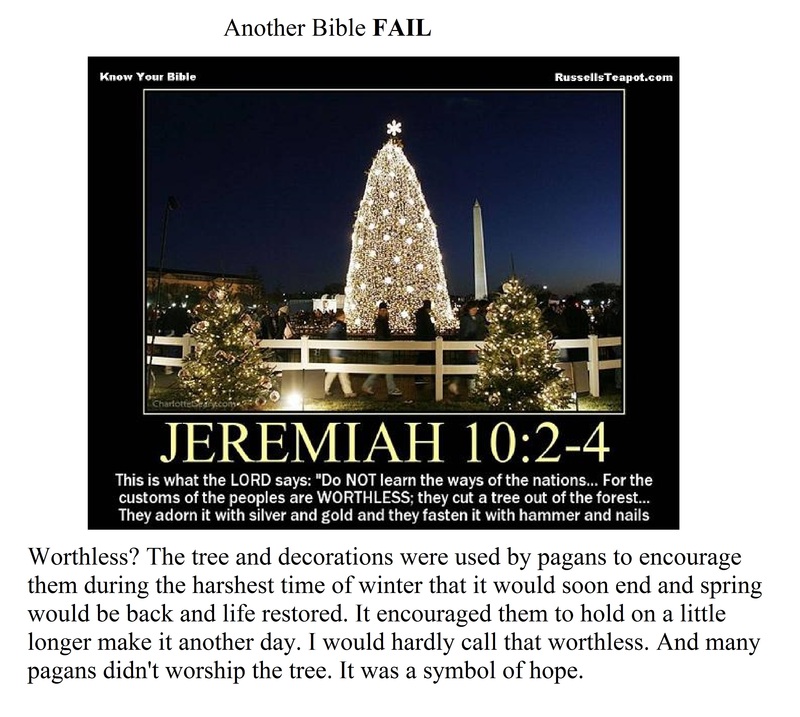 I say mostly because I usually had materials around about how the holidays like Christmas originated from pagan practices which at the time I had been taught was evil and demonic. Later I learned that many Christian authors, speakers and material writers often have no conscious about blatantly lying. Sill, I could hear the stress in my new friends voice and I had no intentions of taking Christmas away from her. I explained that we didn’t celebrate Christmas but that I didn’t have problems with other people celebrating it. 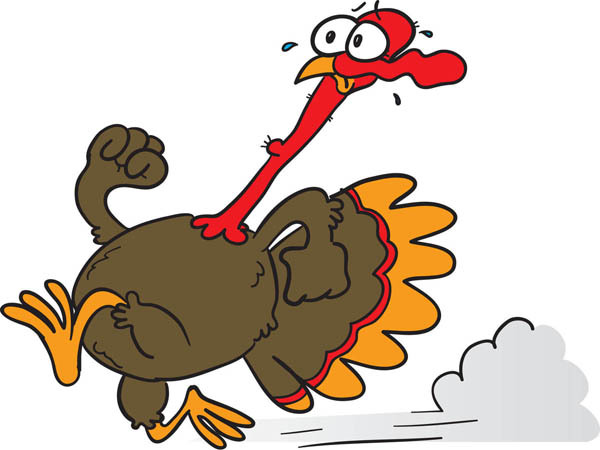 About the “sour” turkey… Way back when, well, when the church I was in was based in my home state, California, the church leader, Elder Turner, would set up church conferences in Louisianan and Mississippi and we would all drive or fly out there for the week long church conferences. They were actually really long three times a day and late into the night and morning church services. One such conference was scheduled the day after Thanksgiving so some others and I flew out Thanksgiving day. When we got there we all met up at a families home who was making dinner for all of us. The family was black Creole. The lady was still preparing the turkey and went ahead and taught me how to make a Creole turkey. It was awesome tasting and most Thanksgivings after that I prepared a Creole turkey that was always a big success. However, to my darling little girl, Hannah, she interpreted the taste as “sour”. I would say though that our first Thanksgiving in Hawaii was a tad sour. We were living in an old Navy housing run down triplex. I like to cook my turkey high for an hour then low over night so it’s really tender. I still don’t know if that oven had a timer in it or there was just something wrong with it but it turned it’s self off sometime after we went to sleep. I’ve never had an oven do that to me before or sense. I still get up all night and check just in case though, that was an uncool experience. Thankfully the next year the Navy decided to tear down the rotting buildings and move us into really nice brand new townhouse units, with an oven that didn’t turn it’s self off. And, thankfully we got out of that cult and I have had fun celebrating holidays of all kinds ever since with my children. And thankfully my new friend understood and we are family to this day. Back to last night. Preston dropped the girls off and took the boys to his place for the night. In the morning apparently I have a habit of trying to make sense of things and remember what it is I have to do for that day and so on. Though it would be better in most cases for me to wait till my brain actually wakes up I still feel the need to do that just in case there is something that needs to be done early. I’ve not only moved a lot but when I was in “that church” I traveled a lot and stayed in hotels and homes and it’s likely due to all that that sometimes I don’t know where I am when I wake up. So this morning when I work up it took me a while to figure out who was home and who wasn’t and what room whoever was home was in and who crawled in bed with me. Sometimes I call the boys and the girls or the silence reminds me they are not there. When I finally straightened out the memory of my boys being at dads I figured it must be Hannah who was in my bed still sound asleep. But it wasn’t, it was Kara. I made it very clear to my kids that anything I agree to while almost asleep or asleep just doesn’t count and to not even try that on me. I never thought I would be the kind but I am, I’m the kind that will agree to just about anything when I’m mostly asleep. So far, other then talking me into letting them sleep with me they have been very good about it. But now that it’s in my memory right now I probably should reestablish that law. Sometimes things like this make me wonder how it was for my mom when I was little and did I pull stuff on her and so on. I remember when my sister and I were little and my dad was working late we would crawl in bed with my mom and lay on each side of her and wait for her to almost go to sleep. Then we’d beg her to tell us a story. My mom loves to tell stories and can not pass up any opportunity to do so. At that time she wasn’t anti-fairy tale so she would ask what we wanted to hear and we would say something like Little Red Ridding Hood or The Three Little Bears or something knowing full well that the story was going to come out quite different. She would start off with let’s say Little Red Riding Hood but as she went on she would start mixing the other fairy tales into it. We would try our hardest to hold still and muffle our giggles in the covers. She’d hear us and whine about us “doing that” to her so we would calm ourselves and then try to get just a little more out of her. It was just too funny. Poor mom! If it were now days we could have filmed her and YouTubed it and likely got a lot of hits. That would have been soooo fun! 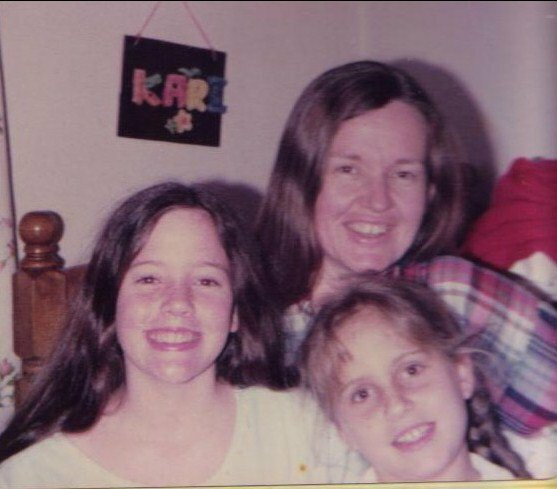 My mom, sister and me (the youngest one). Bringing Back the White Light! It’s a visualization of positive energy. 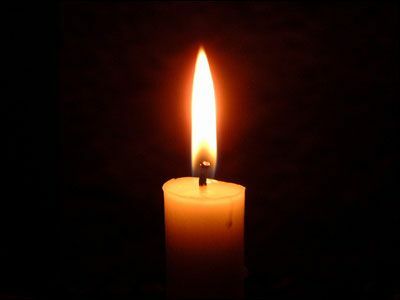 Close your eyes and imagine a candle with a flame. Focus on the flame and there you have it, White Light. You can send it out as healing power or encouragement to friends and loved ones or even enemies you feel the need to bless. Does it work? Maybe, it certainly is possible and, as atheist normally hate to hear, it’s not something you can disprove. If it is blocked or for some reason doesn’t work, it still does good for the sender. Wither it’s actual positive energy at work or it’s a placebo, the good it does is well worth the simple effort. The mind is a powerful thing! That’s how my brain works. I love science and a closed rigid mind can not discover. Science is all about exploration and discovery and possibilities. The trick is to be careful not to harm oneself or others when exploring. That’s why there are rules and proven facts to help guide us. Sometimes those things need to be challenged, but even then one must proceed with caution and use common sense and reasoning while paying attention to hunches and feelings. A few years back I was in a very dark place mentally. I started learning about the power of being positive and the possible effects of “white Light” and such. I was able to visualize it and send it to those in need with out much effort. I also saw how this sort of thing was the same as prayer and meditation and other forms of sending help from where one was at. This helped me re-accept prayer as a positive thing. The same type of action, the same type of results. 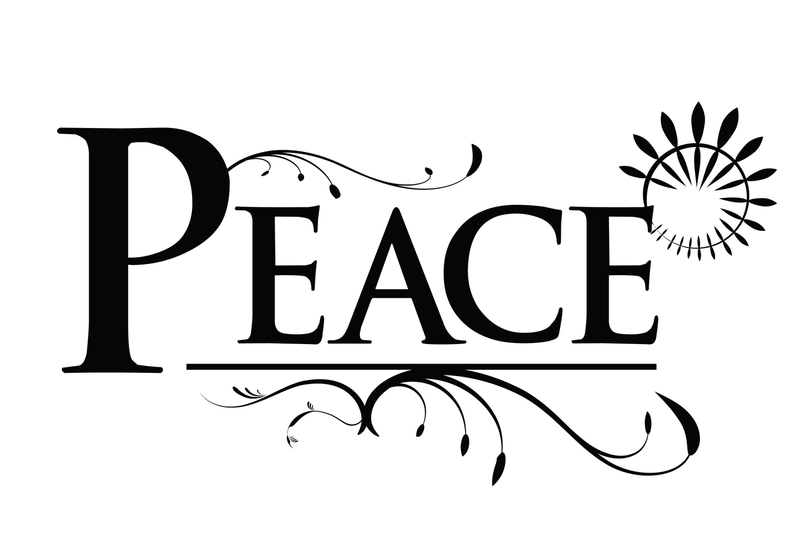 Even the sounds many folks make when meditating reminded me of the peaceful and jubilant times I felt in churches when folks were harmonizing in tongues. Again the same positive effects occurred. There was also the scary times. Though I have heard more scary sounding tongues then meditation sounds. It all depends on the heart, mind and intention of the person making the sound. There is scientific studies done on how sounds affect us and they do indeed affect us. Not to long ago I realized I lost the ability to visualize the light. I could see a candle, but no flame. This concerned me and I considered talking with some friends about this but kept forgetting to. I figured I had been too negative inside myself and must have fed into my negativity more then my positivity and thus the results. 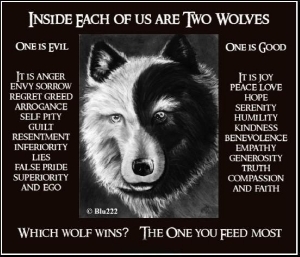 As the old Native American story goes, the wolf I fed the most is the one who grew the strongest. Oops! I was at the local Goodwill recently and was happy to find a book I have been wanting to read. It was at one time on my own personal mental banned book list. I had seen part of the original film when I was a Christian and deemed it very anti-Christ. Since I have left that ridged and corrupt way of thinking I have wanted to re-check it out. I like reading the books more then seeing the movies so I had really wanted to read it. And, there it was on the Goodwill shelf and brand new looking. 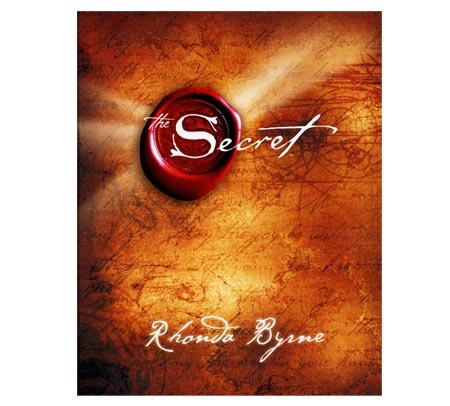 Finally I had my own copy of… The Secret! I started reading it to my boys as they went to sleep at night. Right away I had this thought that maybe this would help me get my “light” back, boost my positive side. I’ve been reading a few pages to them for a while now and it does seem to be working. I haven’t really thought about, well, giving thought to my words and thoughts and training them to be positive for a long time now. I want my kids to be happy and successful so of course I want to pass on what I learn to them which makes me responsible to act upon it first. As I talk to them about it I am cementing the ideas in my own head. While talking to one of my daughters about some of the things I have been reading in The Secret it dawned on me where my lack of light may have done the opposite of spark. A little over a year ago I gave up on trying to make local friends. I had done every thing I knew how and was able to do to make friends and all I got was very hurt and disappointed. I went into depression for three month and that scared me into taking action so I wouldn’t get depressed again if I could help it. My wall of protection was to temporarily not try to make any friends and to just find happiness in my kids and myself. Sure I would enjoy when someone chatted with me on Facebook or e-mailed and I loved chatting with random people here and there but I had no expectations of any future happenings. I do believe this is where I started feeding the “wrong wolf’”. I do not have a quick fix recipe for this, but most things worth doing take time. I’m starting off with changing my words and my thoughts to be positive and go from there. I don’t yet have many expectations but in time that should change. Already I feel physically and mentally better. I still have a fear of getting my hopes up but even that is changing. I can’t yet allow myself to expect great things to happen fast, after all I am aware that strong buildings are built brick by brick and not slopped down in a day. But what ever good may come at what ever pace I will be thankful. By the way, I haven’t even gotten half way through the book yet. I was intrigued by SoulPancakes special called Chatterbox today on Super Soul Sunday on OWN. If you are not familiar with it it is a “short” done in the middle of the long inspirational Sunday show. Today they made a large box of balls to sit in in a public area with a sign inviting people to sit for a while and get to know a stranger. 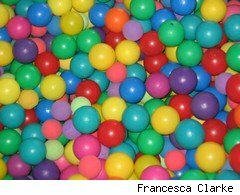 They also placed larger ball in the ball pit with conversation suggestions and questions. You could see a bit of awkwardness on most of the peoples faces and it was beautiful to see it fade away after they discussed some of the notes written on the balls and find common ground and new friendship. I have moved around a lot and have experienced how difficult it is to make friends. I don’t just sit around and complain that friends don’t come to me out of the blue or drop from heaven into my lap, I actually actively try and it is still crazy hard. I’m getting the impression people in general do not want to make new friends. I believe many have their circle of friends and family around them and by making room for new friends they may have to adjust something or they could be making a mistake and become uncomfortable for a while so why try in the first place. Oh, people can be friendly alright, but it’s a temporary friendliness, not a lasting endeavor. I have joined groups and been to churches and such only to find very nice people who have nothing to do with me except when it’s meeting time. When I don’t show up and don’t leave an explanation on their FB page or e-mail them as to why, they never ask. I even joined online meet up groups but they always meet at 7pm and I have kids that I need to put to bed so that is not something I can actually do. I understand the time is so late cause of peoples working schedules. I’ve thought of starting a group myself and may one day do just that but at this time being the new person in town and getting my own family adjusted is difficult enough. I have very good friends who are family to me that I recently moved away from. I have watched people come and go in their life as well. I’m amazed at how judgmental and self absorbed people are to the point they don’t recognize a potential good friend and they just walk away. Again, I think it has a lot to do with not wanting to put out the effort. Some of it has to do with people being bitter and some people not being able to accept those who are different from them themselves. I think of all the love and acceptance people are missing out on by being to busy or to judgmental to peruse a friendship with not only myself but the few good friends I have scattered around the globe. Maybe it’s because the good friends I have are not shallow and shallow is often what people are drawn to cause it doesn’t appear to take any effort. Another ironic thing is the ever present Murphy’s Law. We do tend to make friends the week or so prior to moving. Sigh! I’m thankful to have FaceBook help me keep in touch with them and then there’s texting too. I won’t give up trying to make friends in my area. If I learn any repeatable tricks I’ll be sure to share them. I hope that we can all become more tolerant and forgiving and not afraid to meet new people and give them a chance. You never know what you may be missing! Here is the link to the SoulPancake video – http://www.oprah.com/own-super-soul-sunday/SoulPancake-Chatterbox-Video. As always, I would love for you to comment with your opinion and please share about your experiences.